Debunking the myth that the months of intense street protests in Rio de Janeiro 2103 were a middle class phenomenon. Before I begin this post, let me very quickly plug FAVELissues new social media presence. You can like us on facebook and follow us on twitter @FAVELissues. You can also follow me @yosoytucker. 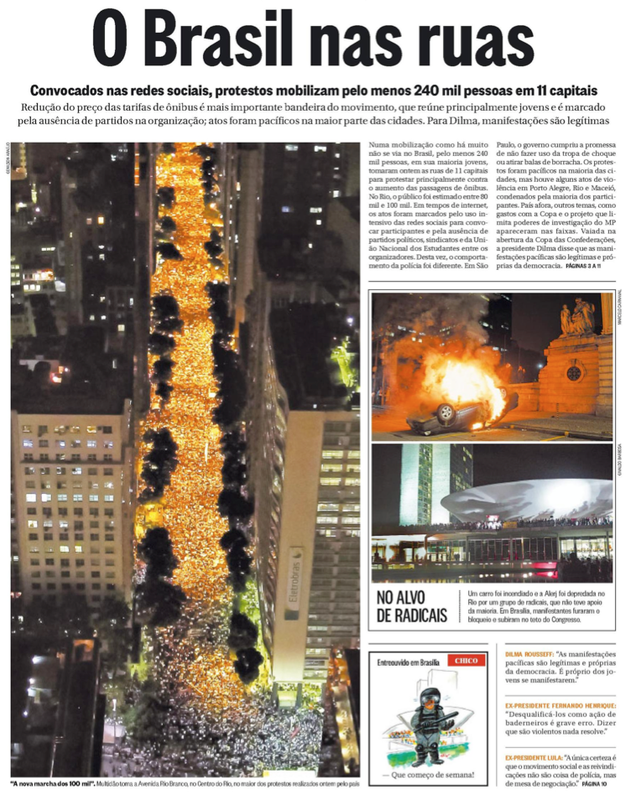 Front page of O Globo newspaper after Rio’s first major street march in June 2013. This coming June will mark the one-year anniversary of the major protests that rocked São Paulo, Rio de Janeiro, and dozens of other cities. I want to revisit the street protests of 2013, precisely because they are no longer at the forefront of the news cycle. Documentation often trumps analysis when social scientists scramble to stay current with the newspaper. Moreover an attempt to analyze events as they unfold with any real methodological rigor is near impossible. At best, the scientist is capable of critical observations; but in the scramble to publish, a fair few simply molded the protests as evidence to their existing arguments without much analysis. 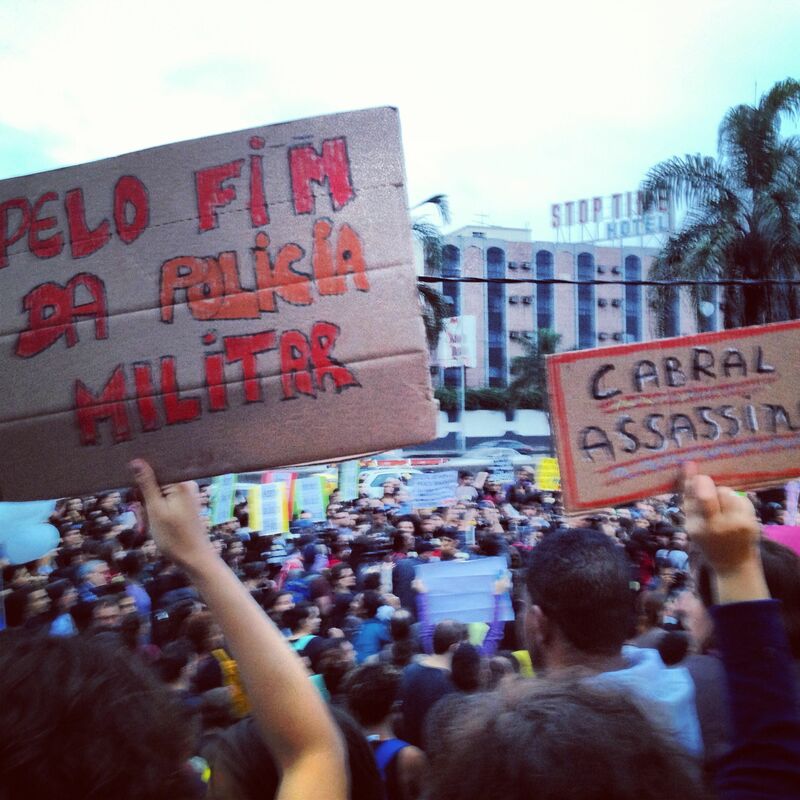 Too many commentators described the urban protests in Brazil as a middle class phenomenon. From the Right and the Left, they demeaned young people in the streets as “daddy’s boys.” Some international journalists and journalistic economists claimed that Brazilians were upset about inflation, high sales tax, and the inability to buy luxury consumer goods. Still others made claims that numbers in the street swelled because protesting became fashionable for a few weeks—it was ‘the thing to do’ for middle class college students. But viewing the protests as a middle class phenomenon with middle class demands renders invisible the many protests organized by “favela activists” (for lack of a better term) and ignores the influence that favela-specific demands had on the general protest movement. I want to highlight the general importance of protests that originated in the favelas. I’m going to offer a small bit of original analysis based on the ethnographic research I’ve carried out in Rio de Janeiro since the initial protests in June. Over the past year I’ve attended about 40 street protests and dozens of meetings, debates, occupations, press conferences and small concentrations. I’ve befriended activists, monitored social media, and took copious notes about the events and my interaction with protestors. I want to respond to the oversimplified and superficial analyses that have led some to criticize the protest movement as a passing fad of middle class youth. And in a future post I will discuss how the persistent dynamic of a partitioned city (or the perception thereof) has played out throughout narrative of public street protest. 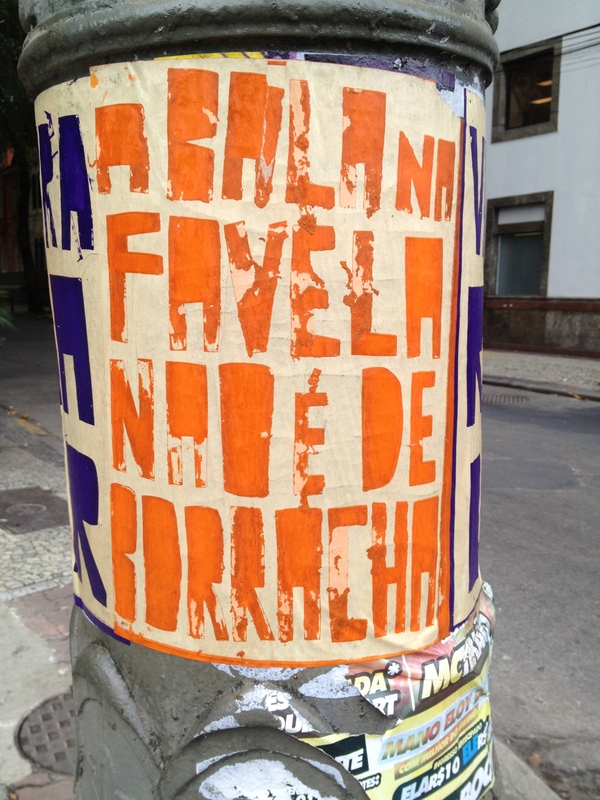 Urban resistance movements in Brazil are localized. While there are similarities between cities, my analysis is specific to Rio de Janeiro. Below I will show that in Rio de Janeiro, mobilizations “from the favela” were a defining component of the general protest movement. Let’s first dispel the notion that the working class who live in the favelas, and poor people in general, didn’t partake in the protests. Surveys were routinely mischaracterized to imply that the protestors were overwhelmingly middle class college students. But these surveys were methodologically opaque, and limited to specific moments and places. One attempt at a multi-city cluster sample (of 2,000 protestors) revealed that 51% lived in households earning less than five minimum salaries (indicating working class or poor status); but news agencies took the same statistic to highlight that 49% lived in households earning more than five minimum salaries. The belief that the protests were filled with disgruntled middle class youth and bored college students contradicts the qualitative data collected by researchers in Rio de Janeiro (including my own data) and colleagues in São Paulo, that consistently shows a diverse crowd by age, race and socioeconomic class. A protest in Complexo da Maré in June 2013 in response to mass murder committed by the BOPE elite squad police. The first major protests in Rio de Janeiro occurred during the third week of June. On 16 June a small protest outside Maracanã stadium was repressed and most of the newspapers condemned the police violence. This encouraged 300,000 people to march on 18 June and then finally 1 million on the 20th, which was the biggest protest in the country. The first protest in Rio de Janeiro that was organized by favela residents with local demands took place on 25 June in Rocinha, a mere seven days after the first major march. And within a week from the 25th, protests had also taken place in Complexo da Maré and Favela Santa Marta. Each protest was well attended—even in the rain the very small Santa Marta was able to turn out around 1,000 people. As a side note, I would like to say that large protests are not necessary for social change, and the fact that activists in Rio, São Paulo and other big cities have not succeeded in turning out numbers in the tens or hundreds of thousands since June/July of last year is not cause for cynicism or disappointment. The persistent and strategic actions of social movements create change, and large demonstrations are only one tactic of movement building. 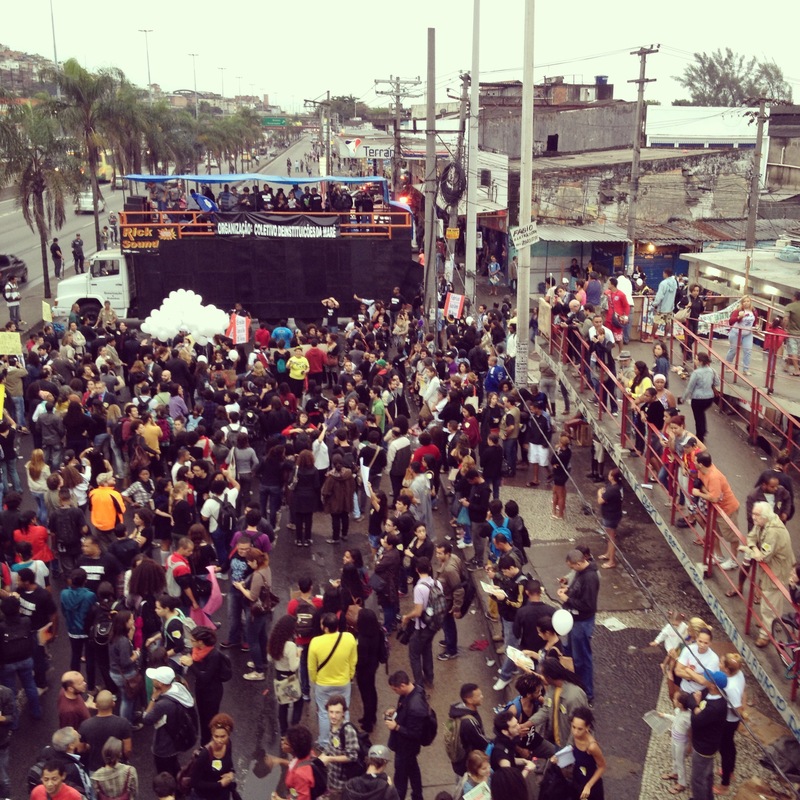 If the multiple protests that in total brought tens of thousands of favela residents and allies into the streets aren’t enough to dispel the myth that the protests were a middle class phenomena with middle class demands, there are numerous examples of how “general protests” (those supposedly dominated by middle-income Brazilians) have been influenced by the demands and discourse of resistance born in the favelas of the city. I do not have time to account for each “favela protest” or cover all of the cross-over demands; so below I will list three clear examples. The first is the reinvigorated call for demilitarization of the police force. Brazil’s police–with historical roots dating back to the city’s imperial era and continually influenced by the 1967-1985 military dictatorship–are ruthlessly violent, underpaid and overworked. Demilitarization, as currently outlined by proposed constitutional amendment 51 introduced by Senator Lindberg (Workers’ Party, Rio de Janeiro), translates to a near-complete reorganization of public security, including how police are trained, institutionally organized and to whom they are responsible. The calls for demilitarization are by no means new, and the current proposed amendment is just as unlikely to succeed as previous similar proposals. However, in the context of the protests initiated last June, demilitarization became a central demand only after activist-networks in the favelas staged protests against police violence. Specifically, demilitarization took center stage at a demonstration organized in Complexo da Maré after Rio’s “elite squadron” invaded the conglomerate of favelas in a vengeful killing-spree. It was not even the first time the activists organized a protest against state violence. A similar action took place in Complexo da Maré during February. But I didn’t see the demilitarization demands echo throughout the generalized street protests until after the June 26th event. A second example is the outrage of impunity and abuse of power by police of the pacifying units (UPP), a favela-specific squadron practicing “proximity policing” to reclaim territory from drug trafficking gangs (although largely ignoring the areas controlled by the equally illegal paramilitary police mafias, known as milicias [milícias]). Amarildo Dias de Souza, a poor laborer from the favela Rocinha, became emblematic of the 2013 protests after he was kidnapped, tortured and murdered by UPP officers who then dumped his body (never to be found) and hatched an elaborate cover-up scheme. He would have been just another invisible victim had residents in Rocinha not organized multiple protests that shut down a principle road tunnel that connects Rio’s South and West zones. These activists often marched to then Governor Cabral’s beach penthouse in Leblon where they were met by large groups of allies. 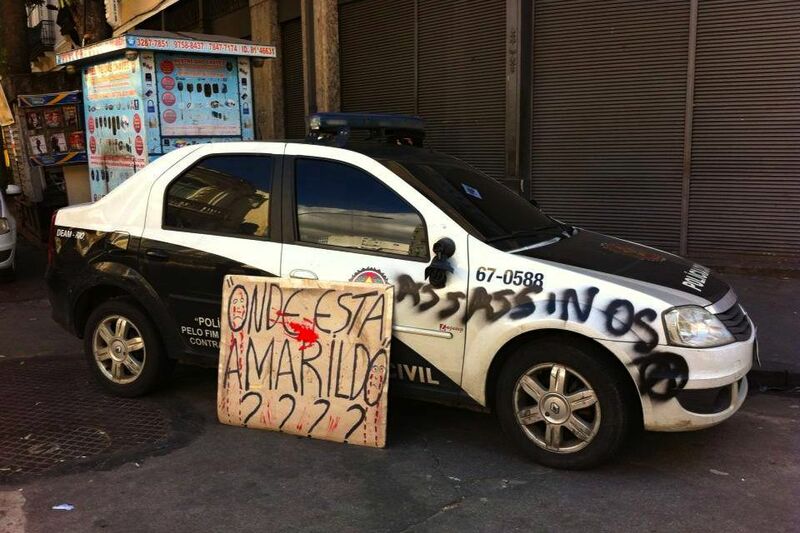 Amarildo’s name was called out in every protest I attended after the initial demonstrations, ensuring that his disappearance remained newsworthy and ultimately lead to the prosecution of ten police officers. 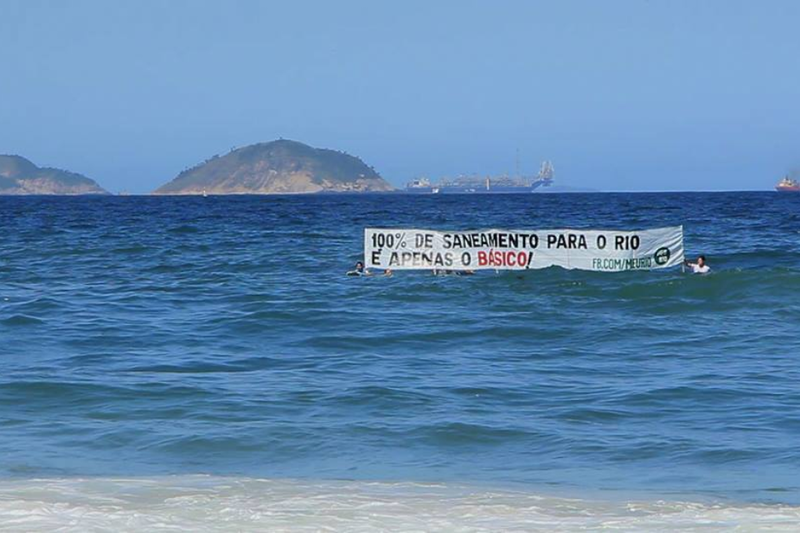 This banner seen from the beaches of Zona Sul was a stunt by Meu Rio at the launch of their campaign. It reads: 100% sanitation for Rio is just the basics! A third example outside the realm of security and violence is basic sanitation infrastructure. The lack of sewage treatment and access to clean water has been a preoccupation of organizers and advocates within the favelas as well as urban planners. But plans to “upgrade” the sewer and drainage systems within favelas go unrealized, unfunded, or simply ignored. The tagline of the first Rocinha protest was “Sanitation Yes, Gondola No!” denouncing the hundreds of millions of reals allocated to building an unnecessary gondola transport system all the while ignoring the sanitary crisis within the community. By September, Meu Rio, an NGO tech start-up that practices civic engagement through online social media (similar to SumofUs in the United States or 38 Degrees in the UK, although organizing at the local level), launched a campaign for 100% sanitation of Rio de Janeiro. Their media savvy tactics have kept the issue of water sanitation in the newspapers (pressuring gubernatorial candidates in an election year). 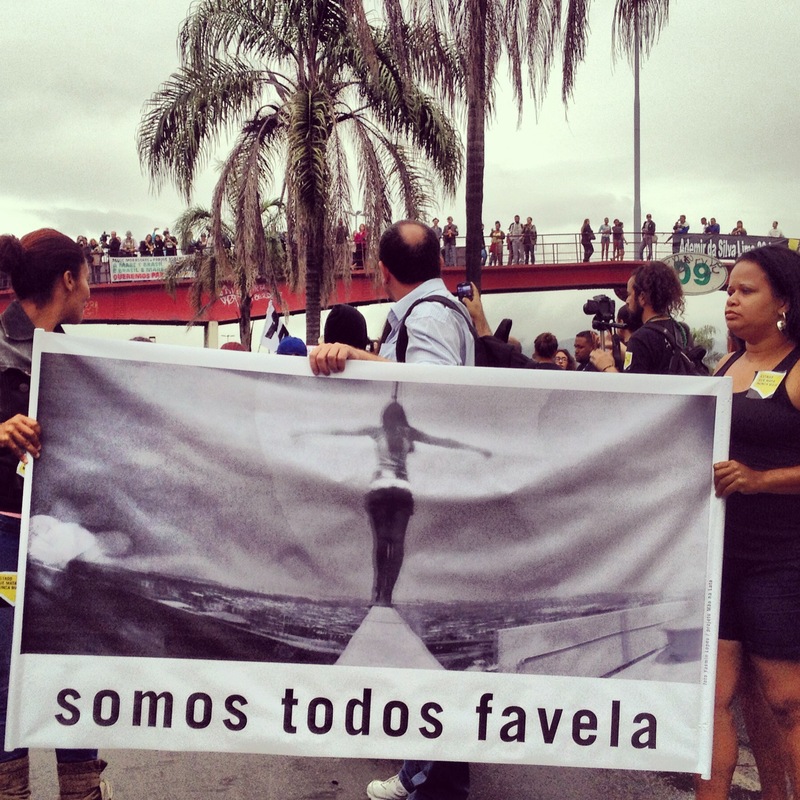 This banner reads “We are all favela” as a slogan of unity in a divided city. This two-way discourse continues to influence middle class activists. As René Silva, founder of Complexo do Alemão’s community news source Voz da Comunidade, recently said in an interview “Rio’s asfalto is closer to the favelas” (asfalto, literally asphalt, is a colloquialism referring to the planned “formal” areas of the city). The radical queer activist and satirist, Rafuko (who became famous for satirical videos on Youtube and performance art during street demonstrations in 2013), was recently questioned by police on a trumped up charges dating back to September 2013. Rather than respond with middle class indignation and middle class demands, he used the spotlight to denounce state violence within the favelas. He recently wrote on facebook: “I’ve lived in Rio de Janeiro since I was born; and I can affirm that the biggest fear of the Carioca [Rio-born citizens] was always ‘the day that the favela descends’ [to the asfalto]. That day, they would riot, rob and kill indiscriminately. That day has arrived! The favela descended. It shut down the tunnel for Amarildo, it marched for Douglas, and dirtied the ground with red paint for Claudia. […] The favela descended more politicized than many academics, and the crimes committed were those of the State.” [note: Claudia and Douglas were two more scandalous deaths in the favelas, both innocent civilians shot by police under suspicious circumstances]. While the examples above to show the “asfalto” approximating the favela, there were still much dissimilarity I noticed between “favela protests” and those of the general sort. Next post I will focus on the particularities of “favela protests,” discussing the differences in performance citizenship through resistance and the corporal vulnerabilities. It’s still very hard to know who the protesters are, even as more of them pop up in peripheral neighbourhoods and in favelas — protesting police violence, mostly. One version is that they are commanded to burn buses, etc., by drug traffickers. Who knows what is really going on! Thanks for the comment Julia. As far as the protests I mention in this post, I think we do know more or less who the protesters are (were). The organization was transparent and leaders spoke to the press (perhaps more relevant, the mainstream press was on scene to speak to leaders). I don’t think anyone would deny that some protests are sometimes “commanded” by gangs, but I don’t think that is a reason to discount ‘favela protests’ as a catch-all category. It may be a reason for local journalists to do a better job of talking to favela residents, but I’m not holding my breath. To me, the immediate association of acts of resistance (be they organized or spontaneous, peaceful or aggressive) with the ‘traficantes’ is a campaign to justify more police and harsh response. I some of the organizing activists in Alemão, I’ve been to their events, and I’ve seen the police surround and film them, and successfully intimidate them to stop hosting open-air community meetings to discuss police-resident relations. ← Por una Historia a la Inversa: II. ¿Favelismo?